Maybe you haven’t noticed, but I haven’t made banana bread yet this year. I’m not sure what it is about banana bread, but it seems everyone has their own favorite recipe for it. There’s simply too many versions out there to pick just one or two, so I’ve decided to dedicate an entire week to it! I’ve got a countertop full of blackened and half-rotten bananas, all ready to go! 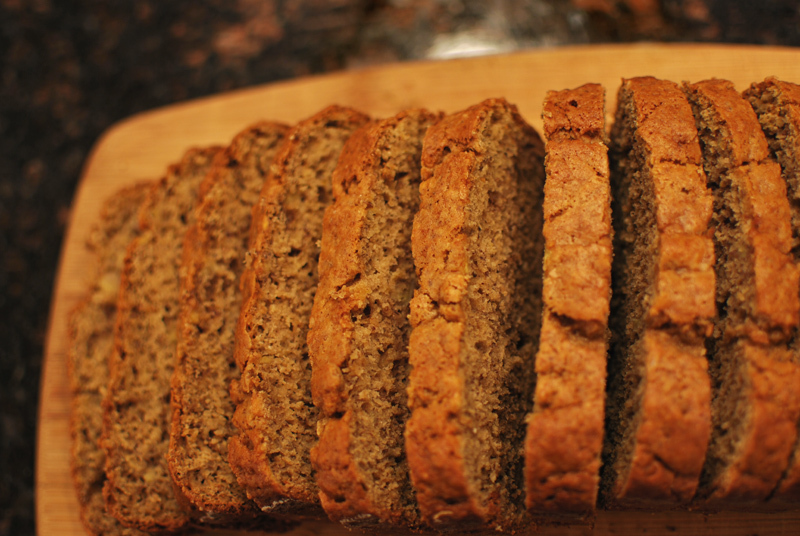 First up this week is my favorite go-to banana bread recipe. It was published ages ago in Bon Appétit Magazine, and I’ve tweaked it to perfection over the years. I can practically make it with my eyes closed anymore. The main selling point of this bread is that it’s low-fat – only 1 tablespoon of oil! – but you’d never be able to tell. Somehow, this bread remains moist and tender, all without the mountain of fat that goes into so many quick breads. It’s not greasy at all, and is just full of banana flavor. It slices easily, and is fantastic toasted. I usually make this in a loaf, as it tends to be slightly dry when made into muffins; but that’s nothing a spot of butter wouldn’t fix! I’ve added some ground flaxseed into the batter, as it lends a pleasantly nutty flavor, without having to worry about toasting nuts (something I somehow always forget to do). If you don’t have any flaxseed around, you can just leave it out; but I do suggest trying it. It’s delicious! And just in case you were ever wondering, overly-ripe bananas make the best banana bread because the complex sugars in them have had time to fully develop. Ripe bananas, ones that are perfect for eating out of hand, will hardly add any flavor to your bread; and I think I might cry a little if you use green bananas. Put those under-ripe bananas in a paper bag, and let them ripen for a couple of days. 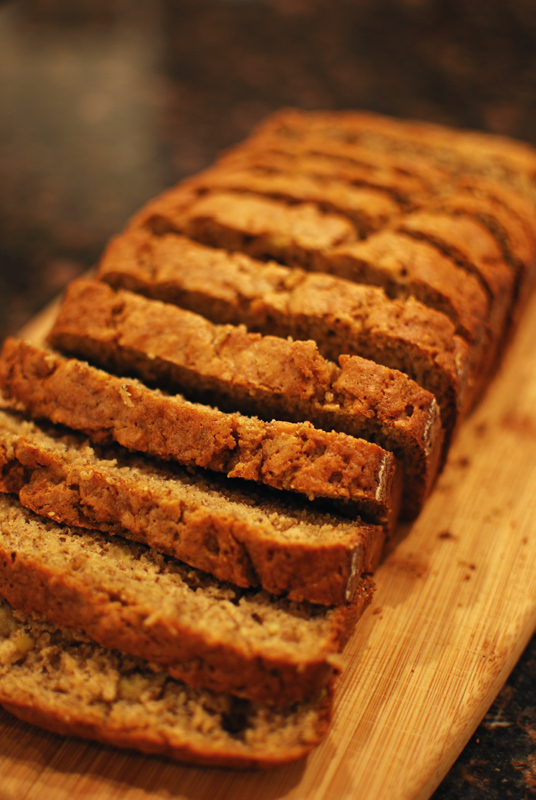 Yes, for the best banana bread, with the most banana-y flavor, you need really ripe bananas. Not speckled with brown dots, either; I’m talking black, soft, disgusting things that peel themselves when you lift them by the stem. Those are juuuust right. And if you can’t get around to making bread when your bananas are ready, just stick them, unpeeled, in the freezer. They thaw pretty quickly, and will just smush out of the skins when you’re ready for them. Easy! 1. Preheat the oven to 325° F. Lightly butter a 9 x 5 inch loaf pan, sprinkle with flour, and turn upside down and knock on the bottom to remove excess. 2. Using an electric mixer, beat the eggs and sugar together in large bowl until thick and light, about 5 minutes. In a liquid measuring cup, smash bananas until smooth. Add buttermilk, oil, and vanilla; stir until combined. Sift together the flours, flaxseed, baking powder, baking soda, salt, and spices; set aside. 3. Add the banana mixture to the egg mixture, and beat until blended. Add the flour mixture, and stir together just until the flour is moistened; do not overmix. Transfer batter to the prepared pan. 4. Bake at 325° F until golden brown on top and a tester inserted into the center comes out clean, about 1 hour. Let cool briefly in the pan before removing to a rack to cool. Serve warm. 1. This bread will keep for a day or two wrapped in plastic at room temperature, or can be frozen beautifully. This entry was posted in Quick Breads, Sweet. Bookmark the permalink.